For each project a mechanical land report is performed to design the most appropriate solution for each location, aiming always to keep costs down, increase cost-effectiveness and recoup the investment as quickly as possible. Adaptability to any type of land. Elimination of the need for foundations due to the driving process. Adjustable inclination angles of -60º to +60º. Extreme resistance and anti-corrosive due to the use of materials such as galvanised steel. Highly qualified staff with a wealth of experience in the photovoltaic sector, both on a national as well as international scale, performs the assembly of the structure and installation of the photovoltaic modules, always under the watchful supervision of the Engineering Department. Once the structure has been assembled, a detailed inspection will be performed by the Quality Standards Department. The ESAsolar T1 structure adapts to the orography of the land, making the assembly process more agile, swifter and accurate, providing welcome savings in costs without foregoing performance levels. This may be installed on lands with uneven ground slopes due to its versatility and the different flattened or raised configurations possible depending on the land type. 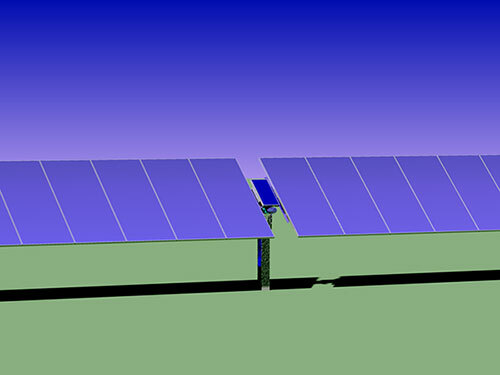 ESAsolar offers assembly solutions for any land typology thanks to the all-purpose nature of our photovoltaic structure. ESAsolar structures are designed in accordance with applicable legislation in force depending on the location of the photovoltaic farm. Depending on legislative demands in different countries, the relevant loads for wind and snow are applied, as well as seismic simulations, should these be required.